Perfect for Valentine's Day, Birthday, Anniversary, or just because! 2. Crumble cake into a large bowl. Add frosting and mix thoroughly. Chill for approximately 1-2 hours in the refrigerator. 3. Make sure the cake mixture is packed tight. On wax paper, roll out to approximately ½ inch thick. You may need to smooth out any cracks with your fingers. 4. Cut out heart shapes with a small (1-1 ½”) cookie cutter. 5. Melt CANDIQUIK® in Melt & Make™ Microwaveable Tray according to directions on package. 6. With a spoon, dip cake bites in melted CANDIQUIK®; set on wax paper. 7. 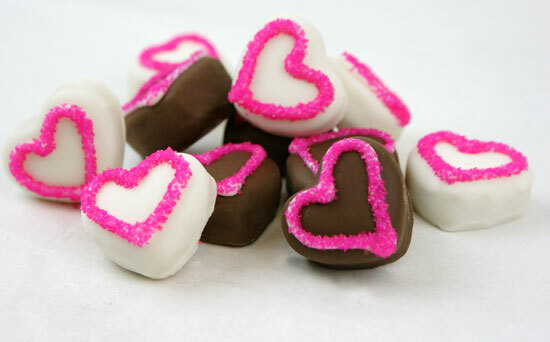 Pipe a heart shape around the edges with vanilla candy coating and sprinkle immediately.